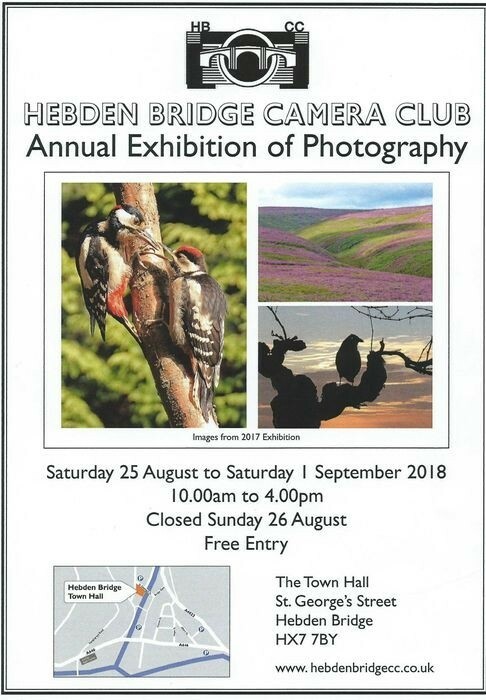 Hebden Bridge Camera Club present their Annual Exhibition of Photography 2018 at Hebden Bridge Town Hall. The exhibition runs from Saturday 25 August to Saturday 1 September, 10:00am-4:00pm, with FREE entry. Hebden Bridge Camera Club is a friendly group of local photography enthusiasts based in Hebden Bridge. New members are always welcome to join. They meet at 7:45pm on Wednesdays at the Masonic Lodge, Hangingroyd Lane, Hebden Bridge. Please check the programme to see what’s going on. The regular meetings run from September through till April. During the summer months they organise biweekly photo walks.